Dashing by design, this short floral-print holiday dress is a stylish choice for semi-formal events all year long. Soft black velvet-spandex cradles the curves in the little sheath dress and makes the light-pink floral print pop. Cranking up the allure, a romantic one-shoulder neckline tops a cap sleeve and drapes asymmetrically across the fitted bodice to provide the foundation for a small fold-over collar. The enticing collar surrounds one arm, splitting as it fans out for a unique touch. 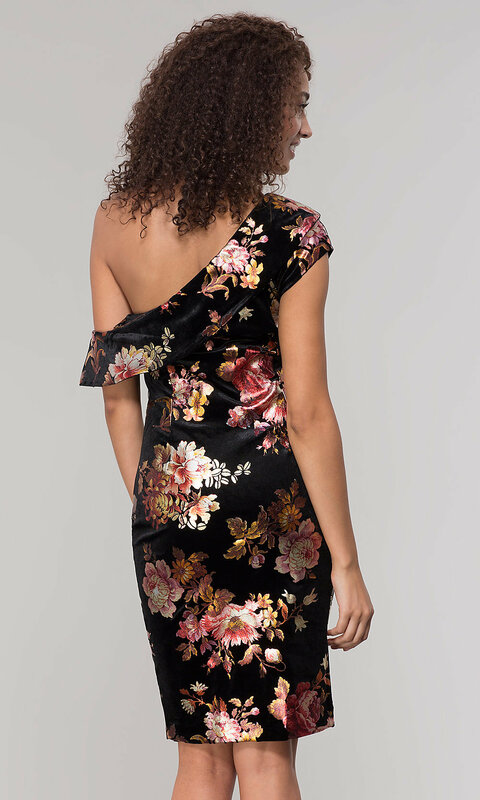 This short floral-print holiday dress makes it easy to look fashionable at seasonal celebrations, parties, and weddings.